9 bedrooms (7 twins, 2 singles). Twin beds can be put together to make large King sized double beds. 1 full bathroom, 4 lavish shower rooms and 1 en suite toilet. 1 full kitchen with oven and hob, extractor, dishwasher, microwave, refrigerator and freezer, coffee maker, toaster. 3 well equipped kitchenettes with refrigerator/freezer, microwave, coffee maker, extractor, toaster. Dining for 24 on pool terrace. Courtyard table/benches for outdoor dining. Private shaded terrace with spectacular views. Central heating and electric heating for winter use. Air conditioning in all bedrooms/sleeping areas available at extra cost. DVD, Hi Fi and VCR systems. DVD, Video and CD libraries. Furnished and decorated with fascinating and colourful items from the owners art and antique farm implement collections. Finca La Asmoladora is a magnificent old country estate in the middle of sixteen acres of almond, olive, vine and orange terraces: a stunning property in a spectacular location with panoramic mountain views. It is a haven of rural beauty, peace and quiet close to the unspoilt pueblo of Parcent - 'paradise between mountains' - but only 30 minutes' easy drive from the renowned beach resorts of Javea, Denia and Moraira. The finca is set up to accommodate groups from 2 to 16 people in Casa Andrago, a superb five bedroom house sleeping eight, and in three charming Casitas, each sleeping two or four. With the provision of extra beds/cots the finca can, however, accommodate up to 20 people. 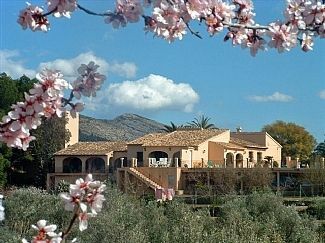 All the finca’s accommodation is arranged around an attractive stone paved courtyard and walled sculpture garden. Casa Andrago is made up of an interconnected Guest House and Tower, each sleeping four, which can be rented separately. Derek and his "novia" Penny de Bernhardt Cookson are British. Derek lived internationally for many years in the UK, Hong Kong, the USA and Canada - during which time he also became a Canadian citizen. For ten years he was Chairman of a company involved in agriculture in Spain - so is familar with all parts of Spain. Penny is a linguist. She speaks Spanish and French as well as Portuguese, German and Japanese. She taught languages until she retired as an Oxford Fellow and college administrator a couple of years ago. Both are interested in Opera, Ballet and Theatre and in international travel. Penny is also interested in archaeology particularly of the Roman period. They love Spain and its fascinating history and make it their main home. They also have small homes in Oxford and the Peak National Park in the UK and an apartment on Lake Como in Italy. They run Finca La Asmoladora together as a hobby - life style business. About 17 years ago, Derek and his late wife, Pam, searched for a large old finca estate to use as their Spanish home for part of the year. They found Finca La Asmoladora at the mountain end of the beautiful Jalon valley. It was Valentine’s Day and all its hundreds of almond trees were covered in incredible pink and white blossom - the finca looked idyllic. They fell in love with its charm, its history which dates back to Roman times, its terraces of almonds, oranges, vines and olives, its spectacular location with mountains on three sides and its perfect peace and tranquility They recognised that the finca, which had been neglected for a number of years, could be gradually converted into the spectacular and lovely country estate for themselves and their guests that it is today. Sadly Pam died some time ago. But their project of careful and sympathetic restoration and improvement which started that February day long ago, continues today as an active and ongoing project of love for Derek and Penny. The finca is an excellent and unique base for groups large and small to combine sea, beach and sporting activities with riding (horses or mountain bikes), walking, biking, climbing, driving or just roaming the surrounding mountains. The finca has its own excellent hard surface tennis court, basketball and outdoor table tennis facilities - racquets/bats/balls all provided. There are also rentable mountain bikes. The valleys lined with fruit and almond trees - an endless sea of pink/ white blossom in spring - and the unspoiled mountain pueblos are a delight to explore. There are two safari parks a short drive from the finca and 45 mins away, a wide variety of theme parks in Benidorm. The family resorts of Javea and Denia - 30 mins away - both have a wide variety of beaches, coves and caves to explore and fascinating historic centers. The finca is ideally located for golf. There are 15 courses within an hour to suit all levels of players. Including the Olazabal designed La Sella and the Balesteros designed Oliva Nova. El Saler, one of the world's top 100 courses is an hour away. Notes on accommodation: Casa Andrago comprises the finca's Guest House and Tower each sleeping 4. The two parts can be rented separately. Extra single beds, children's bed, cots.cribs and high chairs available. Fans provided for summer use. Air conditioning is available at extra cost in all bedrooms and sleeping areas. Ideal for children. Washing machines, drying area,, irons and ironing boards. Outside: Vast tiled pool and BBQ terrace shadded by palm and other trees. Huge pool sized for 36 people. Covered BBQ area with dining for 24 - 8 under cover. Sunbeds for 16. Tennis court. Hard tennis court. Outdoor table tennis. Basketball facilities. Mountain bikes available for rent. Pretty walled sculpture garden. Delighful stone paved courtyard with mosaic tables/seating. 16 acres of terraced grounds including a wilderness area. Historic Roman ruins. Many walks on the finca's own land. Surrounded by spectacular mountains on three sides and at the center of the best rock climbing area in Spain, La Asmoladora is superbly located for all mountain based activities. It is an ideal base for climbers, walkers and cyclists. But is near to superb beaches. Equally an ideal base for searching for property to purchase in the Jalon valley and nearby coastal area. About 25 minutes easy drive from the excellent beaches of the family coastal resorts, Denia, Javea and Moraira. Alicante and Valencia airports each about 95 km/75 minutes easy drive away, mostly by motorway. A car is essential. The small villages of Parcent and Alcalali are just over 1km away. The historic cities of Alicante and Valencia are 75 minutes away. There are at least 10 restaurants plus bars, bakeries and a small supermarket within 1.5km of the finca. Large supermarkets are 8 minutes away. The Terra Mitica theme park in Benidorm is 35 minutes away. The fascinating fortified pueblo of Guadalest is 1 hour away. There is a dinner-dance restaurant and a Flamenco restaurant 40 minutes away. There are several international class golf courses within an hour. Booking Notes: Reservatiom start and end any day of the week. Casa Andrago and the three Casitas can only be rented in the Summer season, 15 July to 25 August, as part of a rental of the whole of Finca La Asmoladora They cannot be rented separately. All reservations of the whole of Finca La Asmoladora 15 July to 25 August must start and end on a Saturday. A deposit is required to confirm a reservation. The balance is due 2 weeks before the reservation commences. Small contribution charges are made to help defray the cost of final cleaning. A small charge is made for extra beds and cots supplied. Notes on prices: Prices shown for Studio and One Bedroom Casitas are prices for the Studio Casita. Prices for One Bedroom Casita are higher. Price per night are pro-rata. Reservations are only accepted for the whole of Finca La Asmoladora 15/7 to 27/8/2016 and must start and end on a Saturday. Three night minimum at other times of the year. Special pricing for Xmas, New Year and Easter periods. Small contribution charges applied to help defray the cost of laundering and final cleaning. Long lets considered.